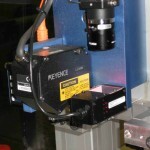 Automated Machinery Robotic Laser Scanning Equipment - Reverse Engineering your products. Have you ever wished to re-create a 3D digital image in SolidWorks by laser scanning? VDK 5000 is a Flexible Robotic Environment (FRE) device used for 3D inspection of composite material structures. This laser scanning system, shown in a XY version, has the capability to take a clear advantage of the modular robotic (FRE) concept reflected in the fact that additional degrees of freedom can be added at a later date. Such an expansion allows the system to satisfy most complex 3D inspection needs. For this application we used a Keyence sensor to recreate the surface of a part. Many other scanning systems may be used depending on your tolerance specifications. 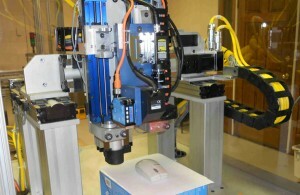 This technology is just another valuable option for a multi-axis robotic work cell. Just think of placing in your part and creating a 3D model and or inspecting a part to verify it is made as expected. Adding in this inspection process will cut down on quality control issues in your factory and will increase your profits.